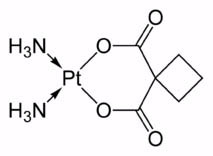 Carboplatin is less chemically reactive than cisplatin, which is why it is less toxic to the kidneys and nervous system. The downside is that the lower reactivity means a higher concentration is needed to fight the cancer, and bigger doses of the drug. It is estimated that carboplatin is 8 to 45 times less effective than cisplatin. The most troubling effect of carboplatin tends to be damage to the bone marrow, in a process called myelosuppression. This leads to anemia. Blood cells produced by the marrow can drop to 10% of normal levels. This level bottoms out a few weeks after carboplatin administration. The severity of this problem is is influenced greatly by which other drugs are included in the combination therapy (see https://www.carboplatin.org/combination.htm) with the carboplatin. Nausea and vomiting can be severe in some patients, and antiemetic drugs are often given. Ototoxicity (ear drum damage) is also a possibility. Your body can also adjust to the drug and the severity of the side effects can decrease over time. Prolonged exposure to chemotherapy alkylating agents can result in up to a 10- to 15-fold increase in resistance. Studies have shown this is due to a response by the body resulting in higher glutathione and metallothionein levels. Metallothionein is a protein that binds to heavy metals and rises when metal levels in the blood are elevated. Oncologists have long known that faster-growing tumors respond more favorably to anticancer drugs that slower-growing ones. Examples: testicular cancer tumors double in size every 21 days while colon cancer tumors double every 95 days and pulmonary adenocarcinoma tumors double every 154 days. The growth rate of a tumor is at a maximum when it is at 37% of its maximum (limiting) size. The limiting toxicities for the platinum drugs tend to be renal – they cause acute tubular necrosis. They can also cause secondary cancers. Many oncology drugs are hazardous. The National Institute for Occupational Health and Safety (NIOSH) has even issued regulations and guidelines for healthcare workers who handle chemotherapy agents. The Institute for Safe Medication Practices (ISMP) lists Carboplatin among drugs which have a heightened risk of causing significant patient harm when used incorrectly. Copyright © Carboplatin.org All rights reserved.